By making the most of the space you already have, the Home Gym Bed™ will transform your bedroom into a fully functional home weight training multi gym in just five minutes. The Home Gym Bed™ is the perfect solution if you live in a small apartment or flat and don’t have the room for large bulky gym equipment. 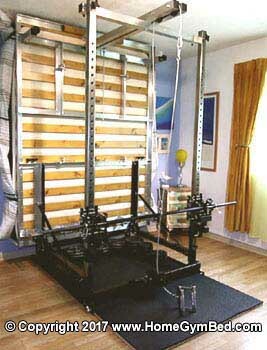 By freeing up your floor space, you will revolutionise your workouts and maximise your potential. When used in self spotting mode, the user can safely work out without putting themselves in danger of injury. 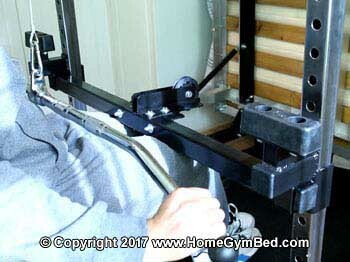 Unlike conventional Smith machines, which have a fixed bar restricting the natural movement of the body, the Home Gym Bed’s™ unique multi-bearing barbell slider tilt unit design enables the user to move more naturally. 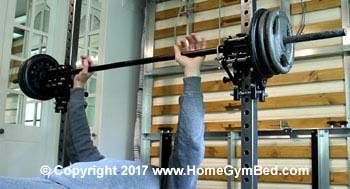 When you’ve pushed out that last rep, the barbell can quickly and firmly be locked at any height with a simple flick of the wrist. Self spotting mode is a great asset if like me you have shoulder and back issues. If preferred, the user has the option not to attach the barbell to the barbell sliders. 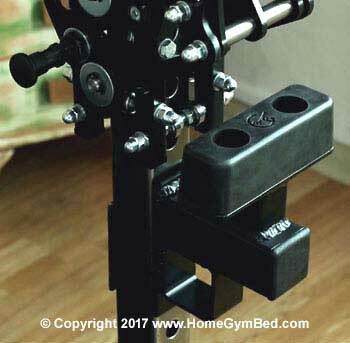 This enables the Home Gym Bed™ to function as a versatile barbell stand for free weight exercises. 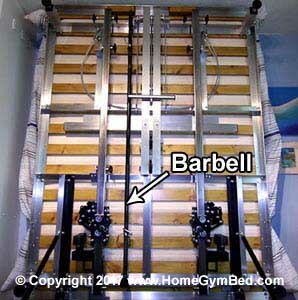 The barbell sliders can quickly be set to any height and cannot move once locked into position. Kneeling cable crunches – cable hammer curls – tricep pushdowns – lat pull downs – seated cable rows – cable shrugs etc. etc. When performing pulldown exercises such as lat pull downs, the bottom pulley assembly can quickly be removed from the bottom of the Home Gym Bed™ and re-positioned at a suitable height to double as a leg brace. 1. When used in either self spotting or free weight mode, the safety stops will make sure that if you need to put the weight down fast, the barbell and weights will hit the stops and not you. 2. When performing cable exercises the safety stops are used as a rest/start position for the barbell and weights. 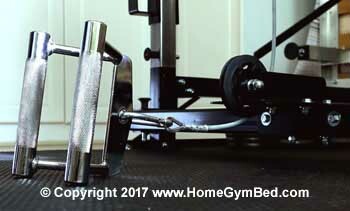 The Home Gym Bed™ has been designed for a standard 6ft barbell. 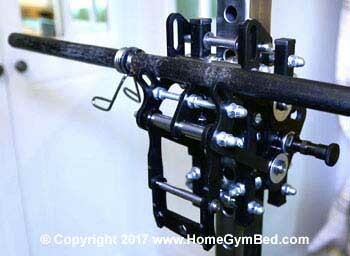 To make storing the barbell easier when not in use, a barbell storage facility has been incorporated into the main bed frame. 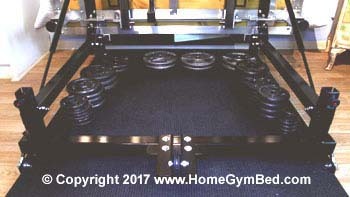 The space underneath the Home Gym Bed™ makes a perfect place to store your weight plates. This also makes it very convenient when changing plates for different exercises. 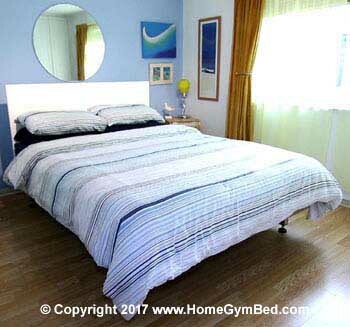 When you’re not working out, the Home Gym Bed™ is a stylish, super sturdy king size bed that will last you a lifetime. You’d never know that the bed is also a Smith machine, cable machine, multi gym. Do you need a Home Gym Bed™ ? If you haven’t got room for bulky, space hungry, gym equipment and would like to build yourself a Home Gym Bed™ then you can buy a HGB Build Information Pack.